Prime Minister Theresa May raised the United Kingdom’s threat level Tuesday night, saying that another attack “may be imminent,” just one night after a bombing at an Ariana Grande concert in Manchester, England, left 22 people dead. May raised the U.K.’s alert level from “severe” to its highest rating, “critical,” and deployed the military to guard concerts, sports matches and other public events; take to the streets; and replace police officers guarding key sites, the Washington Post reports. 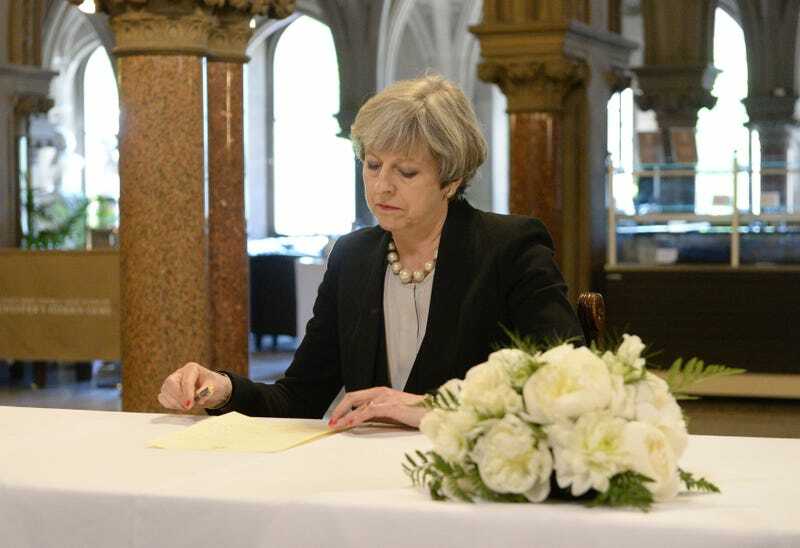 May chaired a meeting of her security Cabinet and concluded that 22-year-old British citizen Salman Abedi, who reportedly carried out Monday night’s attack, may have been part of a wider network that is poised to strike again. Abedi lived a short drive from the concert hall, and his attack was claimed Tuesday by the Islamic State group, or ISIS, which said in a statement on the online messaging service Telegram that one of its “soldiers” was responsible, according to the Post. The group did not give any details about the attack or how it was carried out, which raised doubt about the claims. The Post notes that the Islamic State has quickly claimed links to prior attacks, but some of the previous boasts have not been proved. Although experts and officials have cast doubt on the group’s assertion, authorities have continued to conduct searches, arrest potential accomplices and increase security at public events that could be vulnerable to attacks like Monday’s. The chance of an attack in the U.K. at any given time has been highly likely; the threat level has been “severe” since the summer of 2014. Read more at the Waashington Post.